At 8:00 AM we awoke to a light tapping on the hotel room door. It continued for a couple minutes before I got up to see what was going on. It was Karsen, she came to see if we were coming swimming. Two minutes later we’re in the pool with the Karsen, Josh and Jeff. 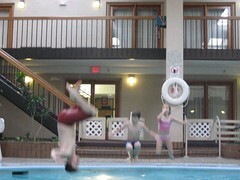 As you can expect Marco Polo was a hit, and so was jump shots into the pool. 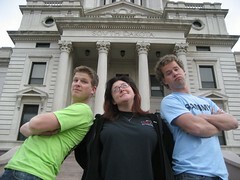 After swimming Jeff bought us breakfast in the hotel, then we headed over to the South Dakota state capitol building. We were told it would be nothing more than a trailer, or an old laundromat. This excited us all, but unfortunately it turned out to be a real building. It’s actually a replica of the Montana state capitol building. At least there’s a typo in the state name on the front doorway. 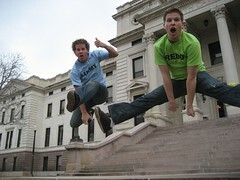 By this time Crissy, our next ride, had arrived from Rapid City to get in on some jump shots from capitol number 36. 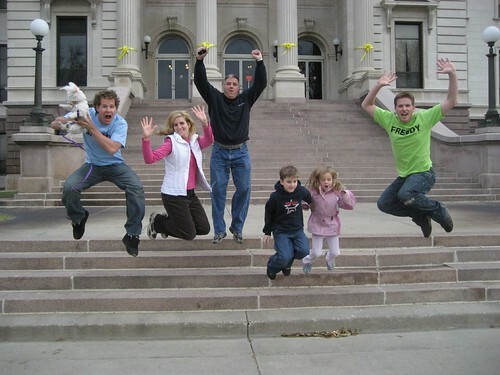 Before leaving and saying goodbye, we got our best jump shot yet with the Anue family. Say guys, that might even make a nice Christmas card. It looks like you're in MN now. I should probably tell you it's illegal to cross-state lines with a duck on your head, and it's even more illegal to enter Wisconson with a chicken on your head. Don't be breakin' any laws, now. "That's definatly a V, Mom...I saw it myself..it says "Sovth Dakota!!" Wow, we have a lot of bvildings with the same type around here. Actually, that's not a typo. The buildings are all done in the Roman style, and that's how the Romans wrote the letter "U". Sorry to burst your bubble. Sammy, did Gizmo land on his feet in that pic? Cuddly lap dogs are rarely known for successful high-flying stair jumping. you still haven't explained the sammy and freddy shirts! i'm so confused. Ha ha ha ha! Dakotans are STVPID! Not all Dakotans (are stupid) Jim Hill!!! Most are very smart...in fact, they are smart enough not to call people from other states "stupid"!!! Told my sister and her friend to keep an eye on your progress. It looks like you might be going through the UP and down thorugh MI. They are in the UP this week and watching for ya! Hey! That's my sister!!!! They are a great family! Great googly moogly. If we could capture the energy expended in the "Whoooooosh" going by the collective we could keep the lights on in the Corn Palace for a fortnight. Ditto on the "vote this the best family in the usa"! My fam is great, but these guys are GREATER!! FYI folks the V in Sovth Dakota is not a typo. The designers did this to keep a Roman theme to the Capital. In the latin language there was no U, instead V's were pronounced that way. That is what a South Dakota education will learn you.